Emmanuel LANSAC1, Isabelle Di Centa2, Olivier Bouchot1, Eric Arnaud Crozat3, rachid Hacini3, Fabien Doguet4, Roland Demaria5, Jean Philippe Verhoye6, Jerome Jouan7, Didier Chatel8, Stephane Lopez9, Thierry Folliguet10, Christophe ACAR11, Pascal Leprince11, Thierry Languanay12, Bernard Alba5, Jean Francois Obadia13, christian Latremouille7, Georges Fayad14, Jean Pierre Fleury3, Alexande Lafourcade11, Mathieu Debauchez1, Florence Tubach11. 1Institut Mutualiste Montsouris, PARIS, France, 2Hopital Foch, Suresnes, France, 3CHU Belledone, Grenoble, France, 4CHU Rouen, Rouen, France, 5CHU Montpellier, Montpellier, France, 6CHU Rennes, Rennes, France, 7HEGP, PARIS, France, 8clinique St Gatien, Tours, France, 9Centre Arnaud Tzank, Nice, France, 10CHU Henri Mondor, Creteil, France, 11CHU Pitié Salpétrière, PARIS, France, 12CHU Rennes, PARIS, France, 13CHU LYON, Lyon, France, 14CHU Lille, Lille, France. OBJECTIVE: Despite growing evidence that aortic valve repair improve long term patients outcomes and quality of life like mitral valve repair, the aortic valve remained mostly replaced. Main reasons are the lack of multicentric comparative evaluation and the common opinion that replacement reduces the risk of reoperation. METHODS: The multicentric CAVIAAR trial enrolled 261 consecutive unselected patients with dystrophic aortic root aneurysm as a prospective cohort comparing 130 patients who underwent a standardized aortic valve repair (REPAIR) associating root Remodeling with an expansible aortic ring annuloplasty versus 131 patients with mechanical composite valve and graft replacement (REPLACE). RESULTS: Mean age was 56.1 years, valve was bicuspid in 115 patients (44.7%). Thirty-day mortality was 4.6% (n=6) in both groups (p=1.00). 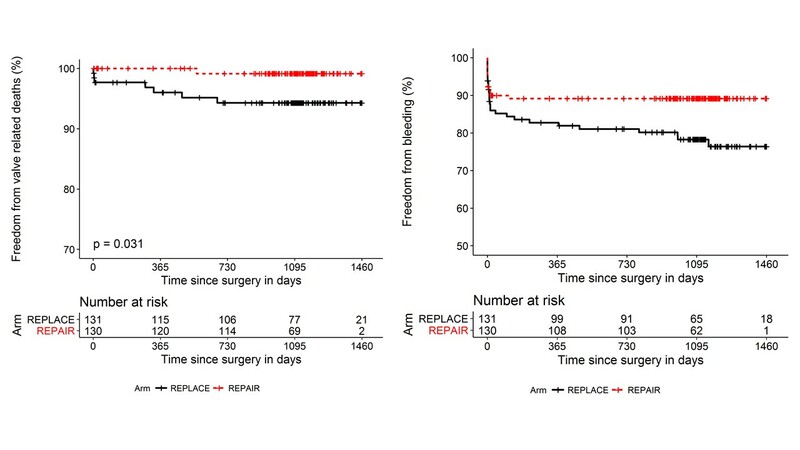 At 4 years, crude and propensity match analysis confirmed that freedom from valve related death and hemorrhagic events are significantly higher after valve repair than replacement respectively 99.1% vs 94.3% (p < 0.001) and 89.2% vs 78.3% (p 0.02) whereas freedom from valve related reoperation was similar (p 0.223). 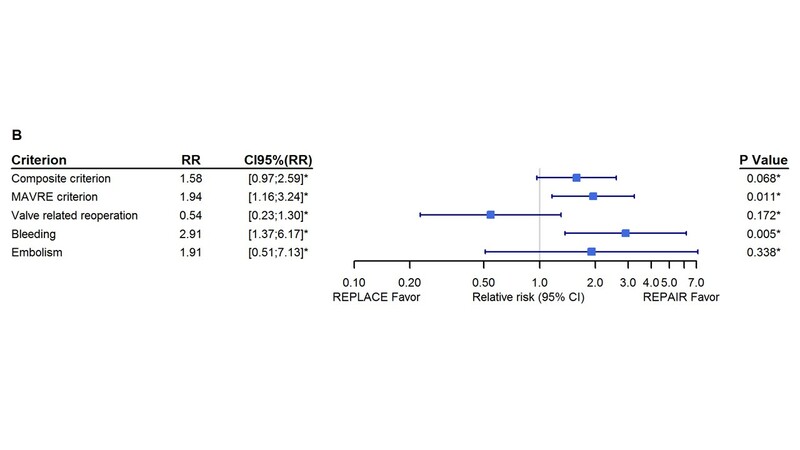 Furthermore Binomial analysis confirmed that risk of major adverse valve related events is significantly higher after valve replacement (RR=1.94 [1.16-3.24]; p=0.011) with the highest risk of bleeding complications (RR 2.9 (1.37-6.17);p 0.005). CONCLUSIONS: A multicentric evaluation of a standardized approach aortic valve repair associating root remodeling with an expansible aortic ring show a significant reduction of valve related death and complications compare to mechanical valve replacement, without increasing the risk of reoperation.